A gang of Indian nanotechnology scientists, allegedly from Annamalai University in India, placed in 2014-2015 several papers in different journals, all of them about nanoparticle synthesis using extracts from various local plants. Most papers went into the journal Spectrochimica Acta Part A: Molecular and Biomolecular Spectroscopy, published by Elsevier. 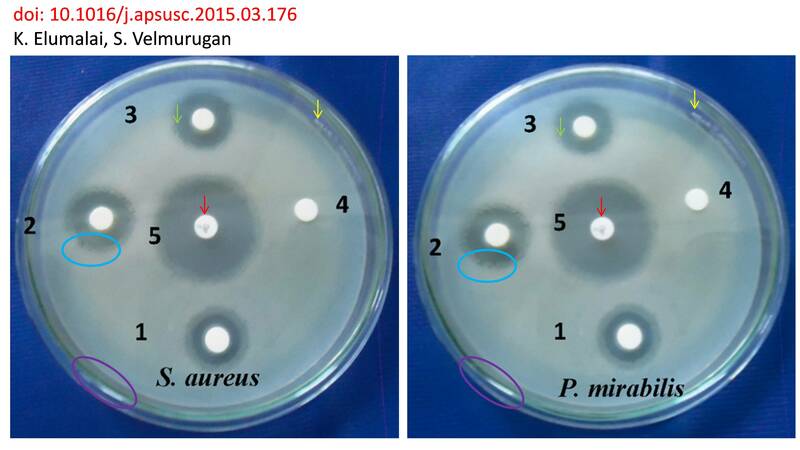 The publications were harshly criticised on PubPeer for their poor science, but also for suspected data manipulations (electron microscopy images, photographs of bacteria dishes and X-ray diffraction measurements were reused across different unrelated papers, see PubPeer examples below). Five nanotechnology papers at Elsevier are now about to be retracted, at least four of them from Spectrochimica Acta Part A. The concerns about research quality and data integrity may have been however less decisive here. The faculties of the Annamalai University carry no mention of any of these authors as their members, all of the provided corresponding email addresses are from Gmail. A publishing scam, possibly including fraudulent peer review, is the likely reason why these papers are being retracted now. Regardless of the data manipulations, these papers should have never been published in a serious journal in the first place. The scientific approach the authors used was evident of some miserably poor science. “All the plants have some carbohydrate and carbonyl groups. These groups are good reducing agents, and as such reduce silver ions to metallic silver. A first year Chemistry student knows it. Over the years I have received a few such Indian papers and recommended to reject these papers and not accept them for publication because of lack of novelty”. Nevertheless, plant extracts are being proposed for nanoparticle synthesis ad nauseam, regardless of the fact that any plant will do the job. You could even use the filling of your vegetarian kebab to publish a useless paper about lettuce, cabbage, onions and tomato extract-based synthesis of metal nanoparticles and their resulting anti-microbial properties (if you really do this, please acknowledge me for the idea). Authors however prefer to pick some exotic or medicinal plants for this task, insisting that the specific active ingredients therein will make the nanoparticles special as well. Which is scientifically nonsense, there is absolutely no evidence for this supposition. Instead, using chemically undefinable plant extracts actually impedes the efficiency of the metal nanoparticle synthesis process and prevents any control over the process. Finally, there is nothing “green” about wasting expensive food on chemical reactions which could have been done with cheap reagents. 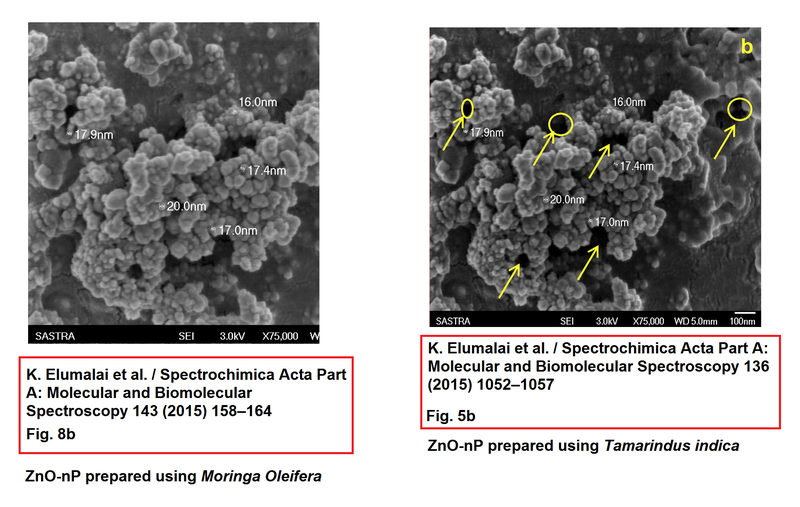 However, this did not stop the editors of Spectrochimica Acta Part A to happily accept in the brief time frame of around one year several papers (six by last count) from same gang of scientists, telling the same story of silver and zinc-oxide nanoparticle synthesis using varying Indian plants. Regardless of data manipulations, the science was always outrageously bad, as PubPeer users documented. Yet it apparently passed editorial vetting and peer review at a respectable Elsevier subscription journal with flying colours. My (personal) conclusion is that any biomass may be used, instead of a well selected rare plant identified by a distinguished botanist. The other conclusion I reached is that at least 80% of the articles in the field include weak or very weak support for the characterization of the produced nanoparticles (assuming that something is really produced at nanometric scale)”. For Bernès’ further professional insights into plant-made nanoparticles, please read below a short Q&A wat the end of this article. History: Received 16 August 2013, Revised 9 October 2013, Accepted 17 October 2013, Available online 26 October 2013. “I am sure you are happy to hear that we have already radically reworked our editorial board in the last 16 months with several new editors (J. Kim, M. Baranska and S. Canuto, two assistants and a managing editor) replacing former editors. In fact most cases, just like the present one, trace back to the same editor, who is not active anymore. These changes were triggered after we realized that the journal is steering into the wrong direction. I am confident that our new board will be much better suited to move the journal forward and preventing cases like the one which you flagged in your original mail. I will have a workshop with all editors at the end of the month and will certainly bring up PubPeer in our ongoing discussion about open ethics cases”. I attempted to contact one of the “old board” editors, Werner Mänthele, who delegated the communication with me to Schulz. Schulz in turn declined to comment, also in regard to the exact identity of the fifth paper. He only referred me to the upcoming retraction notices. The internet archive “Wayback Machine” helped to find to narrow the circle of the Spectrochimica Acta Part A editors who might have been responsible for the publishing of these fraudulent papers. 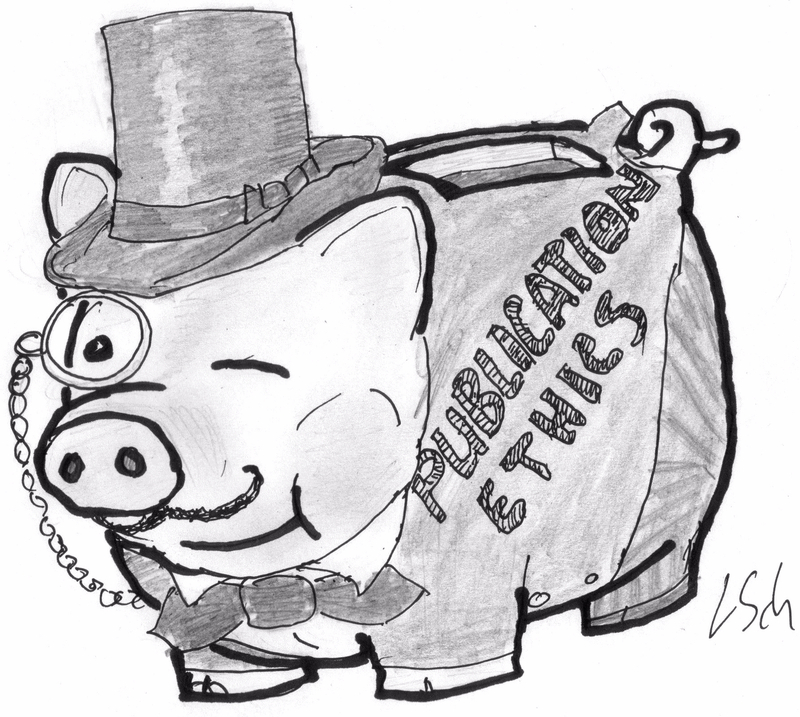 The editors James R. Durig or Bin Ren were board members in 2014, but not anymore. Which one of them was it then? Schulz however remained silent. It looks like Spectrochimica Acta Part A and other subscription journals participated in a publishing scam and fed their reader rotten science. Not only was it qualitatively abysmal, it was also fraudulent. Given that at last one editor was actively involved, it would be inappropriate to call the journal a victim here. All editors read what was being published and nobody seemed to object (i.e., if they actually read what their own journal published). Even now, the members of the editorial board of Spectrochimica Acta Part A, otherwise proudly aware of their function, seem to be hiding behind the Elsevier manager instead of taking responsibility. Q&A on “green” nanoparticles with Sylvain Bernès. Bernès is group leader at physics institute of the Benemérita Universidad Autónoma de Puebla in Mexico and used to work on the field of nanoparticle synthesis with plant extracts between 2006 and 2013. A field professional helped me to formulate the following questions which I now attribute to myself. LS: Is there any control over the synthesis process and the final properties of the obtained nanoparticles in these “green” nanoparticle synthesis approaches? SB: In most cases, no control is achieved. Many, many authors claim they have some control on the composition, shape and size distribution for the nanoparticles they produce, however, these studies are never reproduced. On the other hand, the key point (at least for me), is that these particles are almost ever “characterized” by electron microscopy (TEM, SEM, AFM…). Nothing is commented regarding the bulk material, or how the published TEM images are representative of the green process. In the worst cases (like this one, unfortunately from a group of colleagues), I can’t even see a single nanoparticle in these images (the paper is in Spanish, but take a look at Figs. 3-5). In some cases, however, a real effort is made a posteriori to rationalize the process. For example, by varying the pH, a correlation with the particle size may be observed. Or not. LS: Are the synthesis mechanisms in these “green” methods actually known and understood by the research field community? SB: Still controversial. There is a rather strong consensus about the involvement of some plant metabolites in the bioreduction of metal cations: terpenoids, flavonoids, sugars, polyphenols, etc. In contrast, the following steps leading to nanoparticles have been poorly studied so far: nucleation, aggregation and/or coalescence, and eventual stabilization of the nanoparticles. LS: Does it make any sense to come up with new “green”-nanoparticle-synthesis paper every time a new species of plant or even new plant parts (fruits versus leaves etc.) are tested for this purpose? SB: In no way. This is pure and blatant salami publication, unless completely unexpected nanoparticle shape and/or size is obtained with a specific part of a given plant (and only with that plant). These salami papers are just worsening the deluge of useless literature. LS: Is there any evidence that “green”-synthesized nanoparticles versus nanoparticles of the same chemical composition synthesized without usage of plants/plant extract components have any advantage for usage in biomedicine? SB: I’ve never seen such evidences, however I’m not really familiar with that literature. I’m under the impression that the antibacterial properties of Ag- nanoparticles or the accumulation of colloidal gold in tumors will be the same regardless of the synthesis process. LS: Is the usage of possibly expensive agricultural products a truly “green” approach? SB: “Green” does not necessarily means “cheap”. Expensive starting materials have thus their place in “green” processes. Regarding the synthesis of nanoparticles using plants as reducing agents, I think that the green aspect is the substitution of NaBH4 by a safer reagent (biomass). NaBH4 reacts violently with water, and is classified with code 3 for health hazard in the NFPA system: “short exposure could cause serious, temporary or moderate residual injury”. In other words, the green nanoparticle synthesis using plants is in line with principles 3 and 12 of the “12 principles of Green Chemistry”. I’m a vegetarian but I wouldn’t want to have anything to do with these vegetable-based nanoparticles. I am a vegetarian as well, hence my offer of a research paper on vegetarian kebab-based metal nanoparticles and their anti-microbial properties. Media attention guaranteed! It is Werner Mäntele, not Werner Mänthele. Here I completely disagree with this post. Although I agree the useless repetition of papers highlighting same synthesis numerous times. However, there are few papers that got some striking results (mainly based on the exciting applications) and hence published in very good journals like ACS Nano, Angew Chem, Theranostics, Chem comm etc. Hence, I completely disagree with the comment ‘Useless Science’. West always try to show the Indian or Eastern research as useless. However, the same West fought a legal battle for patenting the Turmeric, Basmati Rice etc. Hence, I request the author to do more research on this topics and kindly highlight the true problems.